Michigan Governor Rick Snyder declared the city of Detroit in a state of “fiscal emergency” on Friday afternoon and announced he would appoint a emergency financial manager (EFM) for the city. The decision had been predicted for weeks, but Friday’s announcement means that more than 50% of African Americans in the state of Michigan no longer elect their local leaders. The EFM holds the position for 18 months, at which point the position is under review. The city council has 10 days to appeal the decision, and they have announced they are prepared to fight the decision. Detroit would join the towns of Royal Oak Township, Hamtramck, Highland Park, Flint, the Village of Three Oaks, Allen Park, Pontiac, Ecorse, and Benton Harbor, which already have EFMs, as well as Detroit Public Schools, Highland Park Schools, and Muskegon Heights Schools which have the emergency managers. 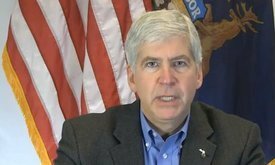 In December, Snyder signed into law controversial replacement emergency manager legislation, just weeks after Michigan voters rejected the previous emergency manager law, Public Act 4.